What is zone control for a ducted heat pump system, and do you need it? Zone control for a ducted heat pump system simply allows you restrict airflow, and subsequently restrict heating or cooling, to a particular room, or zone. A zone may include several rooms that are supplied by a common duct. By restricting the air flow to a zone you will get less heating or cooling occurring and this will give you some degree of control over the temperature in the zone. However, temperature control is fairly limited as you can only decrease the amount of air flow going into a zone, so you can only decrease the amount of heating or cooling that is being applied to the zone. 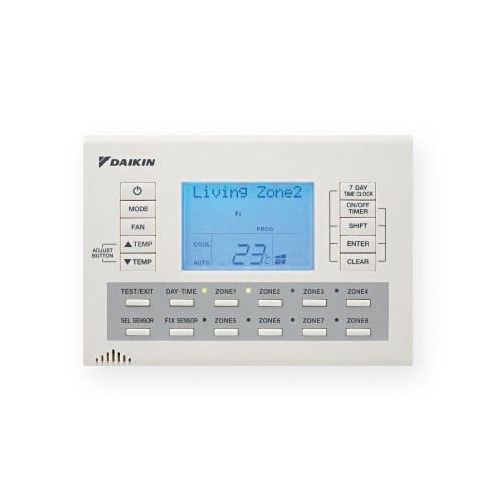 Zone control also only works when the whole system is running and it is not possible to have just a single zone being heated or cooled if the rest of the system is not running. Control is also typically just "on" or "off" for air flow into the zone, which does not give much scope to to adjust the temperature within a given range. Some zone control systems now include thermostat controls and variable damper motors to allow better control of the air flow to a zone and these advances may improve the degree of temperature control that is possible. Zoning is done by simply adding an in-line motorised damper into the ducting that supplies the outlet/s that you wish to control the airflow output. The motorised damper can be controlled by a wall mounted switch in the room, or via a centralised controller. Some ducted systems also allow Wi-Fi control with a centralised zone controller for remote access to turn zones on or off from a smartphone app. While traditional zone control options only allow "on" or "off" control, some increasingly sophisticated systems are now being developed that allow the motorsied damper to be set at a range of positions between fully closed and fully opened which would allow additional control over the amount of airflow going into a room and therefore give better control of the temperature in the zone. A ducted heat pump system will produce a minimum amount of airflow when it is running and all this air has to go somewhere. If too many outlets are closed off with a zone control system then this can result in issues such as over-pressurisation of the system with excess airflow coming from the outlets that are open. This can cause drafts, potential noise issues at the outlets from too much airflow, and over heating / over cooling the space that is not closed off by zoning. A ducted system with zone control will typically need around 50% of the outlets to remain open to airflow to ensure that enough air can freely move through the system. Even if 50% of the outlets are open the system may also need to be set to a low fan speed or need an additional overflow outlet to prevent any excess air flow issues from occurring. With some careful design considerations such as over-sizing the ducting and outlets to allow for the situations when zoning may increase airflow beyond the normal design allowance, potentially including a 'spill over' zone such as in a hallway where any excess airflow may possibly be diverted to if required, and having a good understanding of how to set the system fan speed during zoned operation, then zoning can provide some benefits such as allowing un-used spaces to not have heating or cooling if this is not wanted. Zoning probably won't reduce the overall running costs significantly and can potentially create hot or cold areas in the house where the airflow is turned off. For most homes a stable and even temperature throughout is ideal and this will give the most comfort, so the simplest solution with no zoning is often the best. However, zone control can definitely be of benefit in some circumstances so if you are looking at a ducted heat pump system and interested in zone control options then talk to us today. We can provide you with the advice and recommendations that best suit your own personal needs.